Be the first to share your favorite memory, photo or story of Jennie. This memorial page is dedicated for family, friends and future generations to celebrate the life of their loved one. Jennie Lira Rocha was born on June 15, 1941 in Brawley, California. She moved to Wasco in 1966 and was quickly captivated by its small-town charm. Jennie was a loving and devoted wife, mother, sister, aunt, grandmother, great- grandmother, and great - great grandmother. Jennie made each of her children feel like her favorite. She was a strong woman who battled her illness courageously for may years. 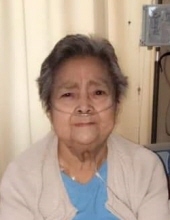 Jennie entered eternal life on March 26, 2019 surrounded by her beloved children and grandchildren. Jennie is survived by her children, Mary Beltran, Virginia Perez and husband Oscar, Victoria Vidal and husband Juan, Cathy Vasquez and husband David, Jess Rocha, Jennie Palomo and husband Joe, Peter Rocha and wife Sandra, Serena Sanders and husband Omar, Mark Rocha and wife Elvira; 73 beautiful grandchildren, great- grandchildren and great - great grandchildren. She is preceded in death by her husband Jesus Rocha; son- in- law, Joe Beltran; many brothers and sisters. To send flowers or a remembrance gift to the family of Jennie Rocha, please visit our Tribute Store. "Email Address" would like to share the life celebration of Jennie Rocha. Click on the "link" to go to share a favorite memory or leave a condolence message for the family.